As we prepare for our twenty fifth anniversary of nurturing the artistry and creativity of underserved youth, there are literally dozens of volunteer positions immediately available to qualified individuals. Listed below are just a few. Or, you may wish to create your own job. What is it you’ve always wanted to do but have for whatever reasons, some real, some self imposed, never begun? Anything is possible. If you can dream it, you can do it. Summer Internships available in Brooklyn NY and Baltimore MD. 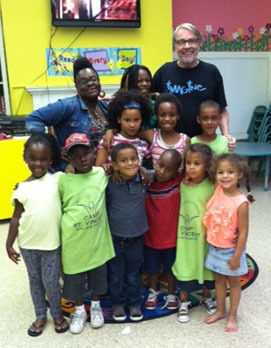 You will be working with our summer creativity workshops in three homeless shelters, 2 days/week, 3 hours daily. Public Relations: We have a wonderful twenty four year resume, but if people don’t know about us, reaching our objectives becomes increasingly difficult. Help us reach out to the media and the public. Schedule meetings with politicians and business leaders. Assist in scheduling our children for TV appearances nationwide. We have a most impressive press kit and support materials to assist you. Assoc. Director of Expansion: Help bring Imagine Project Inc. to your town or city. In addition to our ongoing work in NYC we are currently offering workshops in Newark, New Jersey, Stamford, Connecticut and Baltimore, Maryland. Help us come to you. Writer/Researcher: Assist in the writing and researching of our book, “Rejection Slip!” This book will solicit stories and experiences from celebrities, politicians, sports figures and average citizens who have overcome criticism, ridicule and seemingly impossible odds to achieve greatness. Teaching: Assist in our creativity workshops. This could be a life changing experience. Adult/Children’s Rep. Company: Work with us on the mounting of two Off Broadway productions: “Our Town”, to be presented in late 2017. We will be using celebrity guest artists in various roles. Fundraising: Without this ……. we ain’t. If you are a social being, know and like people and businesses, this is ideal. It can easily lead to a position on our Board. by the Annie E. Casey Foundation. Please keep in mind the majority of this work can be done from your home, wherever you may live. All that’s necessary is a computer, telephone, imagination and a dream.